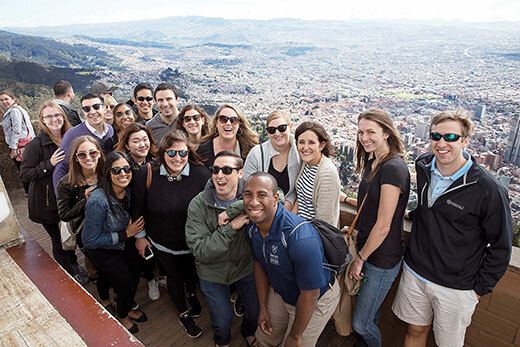 One-Year MBA students travelled to Bogotá, Columbia to learn about business in an emerging economy, and had fun along the way. Even standing in line for a cup of coffee can offer the chance to learn. Exposure like this brings a new level of awareness that is at the heart of an effective business education. At Goizueta, gaining global perspective comes in many forms. Students in every degree program spend hours poring over cases, listening to lectures, and learning the skills necessary to navigate an increasingly complicated and ambiguous world. Additionally, there are more informal ways to gain cultural awareness, such as by gleaning insights from fellow students sitting beside you or on teams. For instance, 17 percent of the current Class of 2021 at Emory University are international students representing 39 countries. Plus, each year Goizueta welcomes nearly 100 exchange students into the undergraduate program. More than 20 enter the MBA programs along with 31 international company-sponsored students, primarily from Japan, Korea, and Colombia. This type of multinational mix at a school that values team-based learning ensures a high level of interaction and exposure for the entire student body.